If two of the characters in Norman Rockwell’s Going and Coming painting came alive, what might they be saying to each other? Write a dialogue between your characters of choice, taking your direction from things you actually see in the painting. Dialogue in storytelling carries much more than information—it can set the scene, advance action, give insight into characterization, and foreshadow what is to come. Where has this family been? Imagine that you are riding in the car, returning home from an outing with them. Using a post card format, sketch and write about some aspect of your trip—where you have been and what activities you enjoyed when you got there. Use Rockwell’s image for informational clues. When you’re done, get a stamp and mail your postcard to a friend or family member. 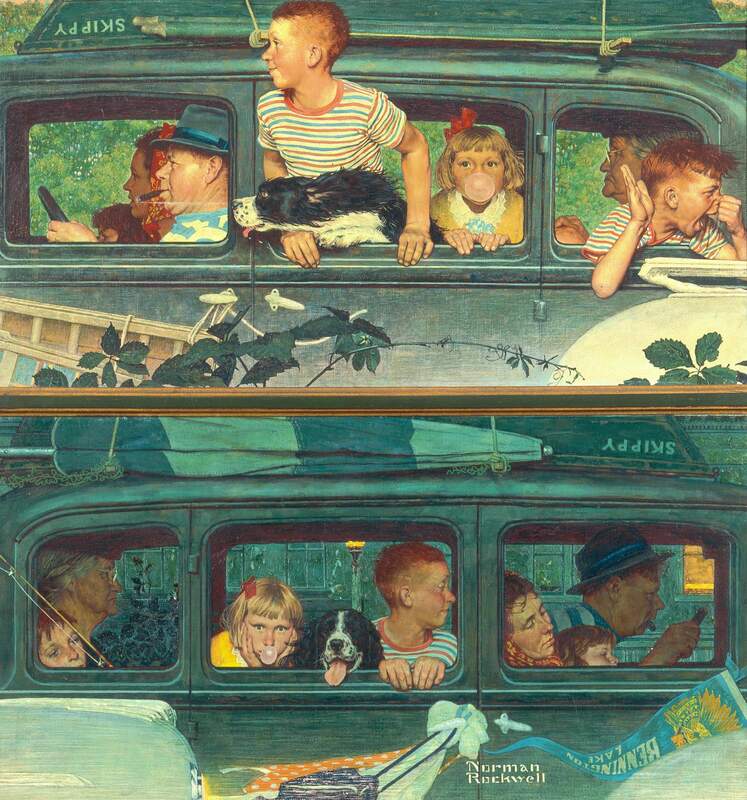 Going and Coming, Norman Rockwell. 1947. The biggest events in our lives are made up of small details; the way we feel, the smells, colors, sounds, and movements around us. The more students can attune to these details, the stronger their narrative writing will be. Observing art is a great way to help students notice all the details that make up a moment and a story. Norman Rockwell’s Post covers were often of seasonal or topical subjects. This was especially true after the 1943 studio fire that destroyed his collection of historical costumes. Not only was a magazine cover intended to be a story that was easily “read” and understood, it was often intended to be relevant to the daily life of the reader. Going and Coming, published in August 1947, is a good example of a story painting that is both seasonal and topical. The added ingredient of humor makes it even more engaging and thus contributes to its success. The use of two images within one picture allows Rockwell to be more detailed and create a continuum of time. We see the before and the after of the imagined event, a family’s summer outing by the lake. Clues abound for the reader’s enjoyment in unraveling the story line. The use of a split canvas to portray a juxtaposition of an event, time, age, or place is an effective device that invites comparison of the two scenes. This technique is employed by Rockwell in only two other Post covers, but was commonly used by other Post cover illustrators. The approach likely derives from the comic strip’s popular use of a series of “frames” to tell a story. Upload student drawings and written stories to share their creations with other teachers and students in the comments below or email to education@nrm.org. Thank you for participating in this exercise! We look forward to your thoughts and to seeing what you and your students create.